Michelle not only teaches 'yoga', she embodies it fully with her heart and soul. I had the opportunity to join her group on Sunday for a hike and mindful meditation at Franklin Canyon Park. About 30 people showed up, and we all had a blast! After the winter rains, we just may have a beautiful waterfall pool awaiting our visit at Sturtevant Falls at Chantry Flats Recreation Area in Arcadia. So, wear your well-tractioned hiking shoes, as there may be a small river crossing, and pack your yoga mat, water, healthy snack and sweater, just in case the luscious trees cool the temperatures along the shady trail. This approximate 4-mile roundtrip trek includes a few gradual hills and an enchanting dive into the Angeles National Forest, where we'll pause for an open-level Flow, Align and Stretch Yoga Asana + Mediation practice, while soaking in Mother Earth's refreshing green love. Friends and family are welcome, and come to connect with new and old friends, too! Meet between 2:00-2:15 below the park restrooms at the trailhead beside the lower level parking lot. Prior to parking, in the lots, you'll need to purchase either a $5 Parking Day Pass available at the Ranger's Station on the upper level parking lot or $30 Annual Adventure Pass (good for several designated state parks), both available at Big 5 Sporting Goods or REI stores. Carpooling and early arrival are highly encouraged, as parking spaces are limited, and overflow parking along the road, if available, may require a mile walk to the trailhead. 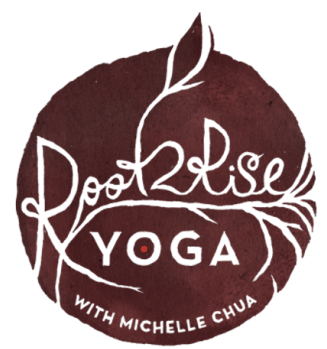 Suggested Donation for Yoga is $10-15 energy exchange with Registered Yoga Alliance Teacher Michelle Chua. RSVP here for 4/7/19 Hike + Yoga to receive event updates and carpooling information. This 4.5 mile trek through the Angeles Forest offers glorious views of Mother Nature, with shallow river crossings, moderate uphill and a downhill return route. Before a refreshing stop at the waterfall pool, we'll practice about an hour of yoga asana and meditation amid the trees, facilitated by Michelle Chua by donation. Wear layered hiking/yoga attire for the mostly shady trail and perhaps your swimwear for wading by the falls and well-tractioned hiking shoes with good ankle support. Bring a friend and meet old and new ones to share in a mindful practice of connecting with our Mother Earth. Please bring ample drinking water and a healthy snack for the stop at the waterfall. Consider wearing odor-free natural insect repellent and sunscreen as needed. Prior to arrival, please purchase your $30 Annual Adventure Pass (good for several designated state parks), available at Big 5 Sporting Goods or REI stores, or consider carpooling. RSVP below by April 21, to receive an email about carpooling options. Stay tuned for more community events in April! You gave us (my partner and me) such a positively unforgettable experience at the Root 2 Rise Yoga Fall Gathering (2013). Michelle is the best! ...She is so creative and inspirational. Plus her yoga events and classes around town and in the park are wildly fun.